Grand Theft Auto Online (GTA Online, GTAO or GTA O and sometimes incorrectly referred to as GTA V Online) is an online multiplayer universe for the GTA series. 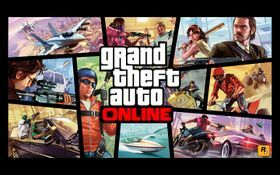 Grand Theft Auto Online is accessible through retail copies of Grand Theft Auto V. There is no monthly subscription fee. GTAO is a dynamic and constantly growing world, as it will continue to expand as content is added either by Rockstar or GTAO players, thus making it larger than GTA V. Though it mimics GTA V at first and is accessible through that game, Rockstar are treating it as a standalone, separate entity from GTA V, essentially even saying that they feel GTA V has no multiplayer mode because GTA Online is so separate. Before beginning GTA Online, the player must create their own protagonist by choosing his or her heritage, then determining which of their parents' and grandparents' genes are dominant using sliding meters towards the maternal or paternal sides. Owners of the GTA V Collector's Edition can choose Niko Bellic (GTA IV), Claude (GTA III) or Misty (GTA III) as relatives, labelled as "parents" since the two picked characters directly determine the look of the online character, while members of the Rockstar Games Social Club can choose John Marston (Red Dead Redemption). The protagonist's daily activities are then customized. Family time, illegal work, sports, and lounging on the couch all impact the protagonist's appearance and skills. The game begins with scenes of Los Santos, eventually focusing on a plane carrying the protagonist approaching the city over Vespucci Beach and landing at Los Santos International Airport. Upon exiting the airport, the protagonist is greeted by Lamar Davis. He greets male protagonists by jumping out of his car, or female protagonists by waiting with a rose in an attempt to seduce the protagonist, albeit unsuccessful. Opening credits roll as Lamar drives the protagonist through the city to the starting point for the Mall or Nothing race. After completing the race (results only affect rewarded money, not the storyline), they are required to steal drugs for Lamar's friend Gerald G. Lamar then suggests a nearby clothing store to "better represent-ate yourself." At this point, the protagonist now has free roam. The protagonist gains Reputation Points (RP) to increase their rank by completing missions or tasks such as losing a wanted level or cruising with another user-created protagonist. Each rank increase unlocks different options in clothing stores, hair salons, mod shops, and Ammu-Nation, as well as missions and perks from other characters. At Rank 5, the player is able to purchase a property to reside in and/or store vehicles. GTA Online is a story-driven experience that intertwines with the single-player story. The player-created character is new to Los Santos and wishes to make it big. Through the player's actions, he/she will rise up the criminal ladder and meet several characters from the single-player story, such as Lamar Davis, as well as others exclusive to GTA Online, who will give them missions. There are over 700 missions, appearing in random order and at random times, depending on the protagonist's rank. More complex missions require higher rank. Certain missions will require specific vehicles, characters, or weapons. There is a collective limit on how many times a team member may die before a mission is failed. This number is displayed in the bottom right corner of the screen. There are also other activities categorized as "Jobs" such as races, deathmatches, or parachuting. Completing jobs earns the player money, which can be spent any number of ways, from purchasing buildings, land, and weapons to customizing their character's appearance, weapons and vehicles. More options become accessible as higher ranks and cash are acquired. Players can also spend money customizing their apartment for their character, and a garage in which they can store and customize up to 10 vehicles. As of the release of the High Life Update, players are able to own two properties. Banks and stores throughout the world can be robbed by the player, but heists will not be available until an update is released, which is slated for Early 2015. Teaming up with others makes pulling off the heists easier; however, there is a chance that a member of the team may run off with the take, making trust a vital part in planning. During a heist, Grand Theft Auto Online uses a voice recognition system. If one or more players yell commands at the bank staff such as "faster! ", the moneybag will be filled faster than usual, allowing for a quicker getaway. Money earned during gameplay is not safe unless deposited into the player character's bank account. If killed, any loose money will be dropped and can be taken by others. Players can insure their vehicles so that if they are destroyed, lost or stolen, they are replaced for a fee. The cost of insurance depends on the the vehicle's class, which in turn is determined by its performance and modifications. Crews were carried over from Max Payne 3 into Grand Theft Auto Online. GTA Online is essentially a GTA MMORPG, though groups of players in one session are limited to just 16. Since the 1 October 2013 launch, the game world has been identical to the San Andreas part of GTA V, though some players have glitched their way into Ludendorff. New locations will appear from time to time. Grand Theft Auto Online and Grand Theft Auto 1 are the only games to date to feature a female protagonist. Unlike the Multiplayer for Grand Theft Auto IV, Grand Theft Auto Online is only attached to Grand Theft Auto V for current accessibility. However it will stay it's own feature even when new games come out. It can be assumed that the exact same set up for GTA Online will be accessible through future Grand Theft Auto games. This page was last modified on 12 January 2015, at 21:41.